I used lots of different products in May, so it was particularly hard to whittle them down into a list of favourites. But whittle them down I did! Also- I realise we’re now almost halfway through June. But at least I’m posting, right? L’Oreal Infallible Mattifying Primer– this primer has basically been my go-to primer recently. It’s silicone-based so it won’t be for everyone, but I find this kind of primer works the best for my skin. I have combination skin which flits between being dry on my cheeks and forehead and pretty oily and shine-prone elsewhere (especially around my nose) and this primer just gives me a nice, velvety, smooth base for my foundation and other makeup to sit on. Urban Decay Naked Skin Weightless Complete Coverage Concealer in Light Warm– this concealer is my new favourite. I’m not sure about the shade- it’s good for covering blemishes but I think I might go for Light or even Fair Neutral to use under my eyes, as it might be too warm for using there- but it’s definitely a complete coverage concealer! It’s creamy, doesn’t really crease and is very easy to blend in. Illamasqua Facet Palette in Aura– this is a bit of a cheat, as there are three parts of this palette that are specifically my favourites for last month but I have been using the whole palette so I’ll let myself off for that. Within Aura, I specifically mean the blush in Tremble– a beautiful, vibrant light pink-, the cream pigment in Hollow– a gorgeous, easy to use toffee colour that is a perfect contour on paler skin tones- and the brow cake in Thunder– the perfect warm brown shade to use on my brows! I also have liked the Gleam highlighter, and all four of the eyeshadows contained within the palette! MUA Professional Eye Primer– this thing is DA BOMB. I’ve got some Urban Decay Primer Potion samples to use up but I still prefer this. It’s just perfect- easy to use, easy to apply, keeps my eye makeup lasting well and makes cheap eyeshadows work the same as my MAC and UD ones. I’ve nearly run out and I’m pretty sure I’ll be buying two or three tubes of this so I NEVER RUN OUT. Illamasaqua Freak EDP– I said this in my May Favourites YouTube video, but I think this may have become my all time favourite perfume/my signature scent. Before now I would have answered that question with Coco Chanel (NOT Coco Mademoiselle, I hasten to add) followed closely by Thierry Muglier Alien BUT I think this has edged just in front. It’s just gorgeous, for day and night. I know not everyone likes using such a strong scent in the daytime but I do and I love it. It’s expensive but I might plump up the money to get the bigger sized bottle when I need to replace it- and I really want to try Illamasqua Freak Scarab too! It’s top notes are (via Illamasqua) Black Davana, Opium Flower and Belladonna, with heart notes of Poison Hemlock, Datura and Queen of the Night blossom and base notes of Frankincense, Oud and Myrrh. I love it. Soap & Glory Smooch Operator Lip Butter Balm– this is a part of my night time (and when I remember, morning!) routine and it’s the best lip balm I’ve ever used, period. It has a gorgeous ‘coconut ice’ scent and it’s smoothing and softening on my poor lips without being greasy. So those are my May favourites! What were your favourite products this past month? 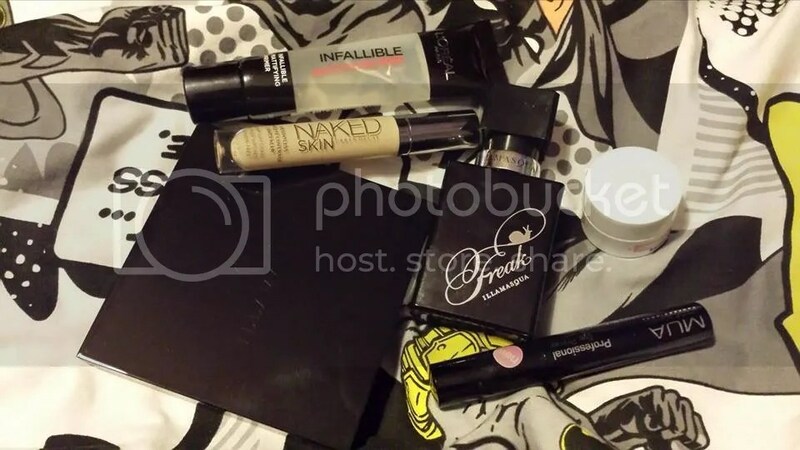 This entry was posted in Beauty, Makeup and tagged Favourites, Illamasqua, Loreal, makeup, MUA, Soap & Glory, Urban Decay. Bookmark the permalink.